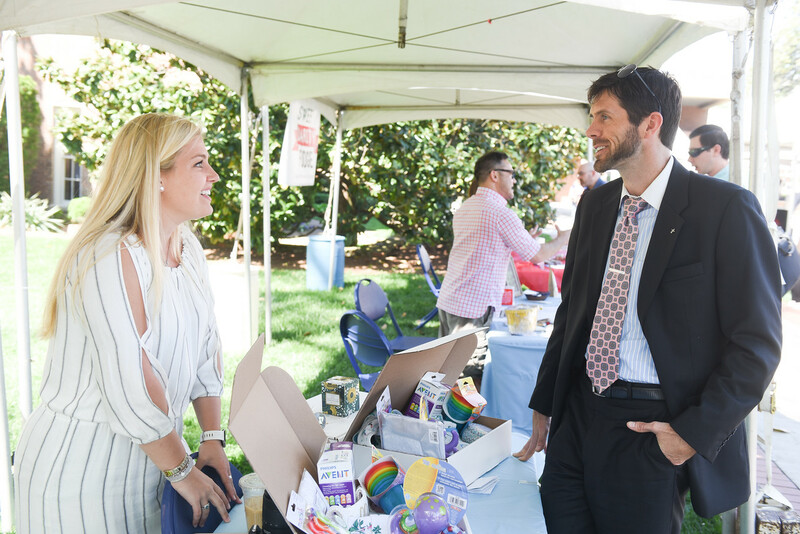 In an event sponsored by Belmont University’s Center for Entrepreneurship, 33 student and alumni-owned businesses participated in the campus’s fifth annual Entrepreneurship Village on April 10. Dedicated to showcasing the innovation, creativity and success of Belmont’s entrepreneurship students and alumni, businesses in the idea, start-up and revenue generating phases participated. These businesses represented a wide variety of industries including design and photography, music business, restaurant, high-tech, fashion and apparel and various social ventures. Students set up booths around the Bell Tower and discussed their business ideas, experiences with their ventures and how they forecast business growth. Several of these student-run businesses have recently taken strides towards success in Nashville’s entrepreneurship community. Senior audio engineering major Ian Rodriguez, founder of Innovo Management, was nominated for Young Entrepreneur of the Year at the Nashville NEXT Awards last November. Innovo Management is a multi-faceted music management and booking company that Rodriguez began almost two years ago. Additionally, junior social entrepreneurship major Emily Waddell was invited to join The National Association of Women Business Owners by the Nashville chapter in February for her work with her start-up The Honest Consumer. The Honest Consumer aims to share the stories of social enterprises, spread the word about ethically made goods and empower consumers to consider their purchases. Third-place winner of Belmont’s annual Business Plan Competition Kendall Warren was also present, showcasing her business The Gift Box Drop, an online retail store that aims to make gift-giving fast and simple. The store lets consumers buy boxes filled with a variety of different items based on the occasion (weddings, baby showers, Father’s Day) and offers to ship the gift directly to the recipient. Belmont’s Center for Entrepreneurship has been recognized as a Top 25 nationally ranked program by Princeton Review for eight years. The University is the only school in Tennessee to be included.